10-Men Churchill Brothers hold Real Kashmir FC to stay unbeaten away from home! Home / Indian Football / I-League / 10-Men Churchill Brothers hold Real Kashmir FC to stay unbeaten away from home! 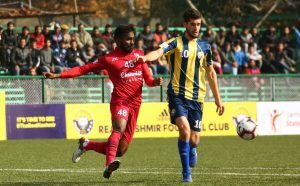 10-Men Churchill Brothers SC held Real Kashmir FC to a creditable goalless draw as history was made at Srinagar’s TRC ground with the first-ever I-League game taking place in the state of Jammu & Kashmir on Tuesday, November 6. Scottish coach David Robertson’s home side will feel an opportunity was lost to register a second successive win in their debut campaign, having won the opener against defending champions Minerva Punjab FC away from home. Real Kashmir FC opted to solely depend on Ivorian striker Gnohere Krizo for a breakthrough, but the visitors’ defence led by Libyan Hussein Eldor and Serbian Nenad Novakovic had a solid outing, thwarting all such designs of the home team. Coach Robertson had an unchanged line-up from the eleven which beat Minerva Punjab FC in their opener while Churchill Brothers’ Romanian coach Gigiu opted to start with Lamgoulen Hangshing as his Under-22 pick instead of Vinil Poojary who had started in the previous game. It was end-to-end football in brilliant sunshine, but chances were few and far between in the first half. Danish Farooq hit the bar for the hosts as early as the seventh minute. Then Churchill Brothers’ Israil Gurung broke away on the left flank in the 13th minute and his cross found Langshing with a free header inside the box but his effort went just over the bar. Krizo was also making his presence felt with some aggressive runs down the middle and putting Eldor and Novakovic under considerable pressure. He rose for a header in the 37th minute but the weak effort lobbed over the Churchill Brothers bar. Willis Plaza broke free on the right side of the Real Kashmir FC box and his shot missed the far post, not by much. James Kithan, in the Churchill Brothers goal, sensed the danger and rushed out of his box to thwart Katebe. The Zambian tried to go around him, but a falling Kithan in the heat of the moment inadvertently stopped the ball with his hand and was promptly sent off. Churchill Brothers ended the half honours even, but with 10 men on the pitch, Vigneshwaran ‘Vicky’ Bhaskaran now in goal, brought on in place of Langshing. In the second half, Churchill Brothers sat deep but the hosts embarked upon a strategy to try and find Krizo with long balls from the deep defence. Their second option was to penetrate down the middle. Krizo did hit the bar once in the 65th minute after breaking into the box, this time from the left and unleashing a wonderful right-footed curler. The other opportunity was when Katebe and Danish Farooq played a 1-2 on the right and the latter’s shot from inside the box was saved by Vicky in the Churchill Brothers goal. Churchill Brothers had the last chance of the game when Dawda Cessay got onto a free-kick halfway between the goal and the right corner flag. His floater was good but could not find the head of a Churchill Brothers player. Churchill Brothers now have three points from their three draws while Real Kashmir FC have picked up their fourth point after their second game. Real Kashmir will now host NEROCA FC on November 11. Previous Valencia CF name capital.com as their official trading partner! Next VIDEO – Mumbai City FC: Rapid Fire – Joyner Lourenco!